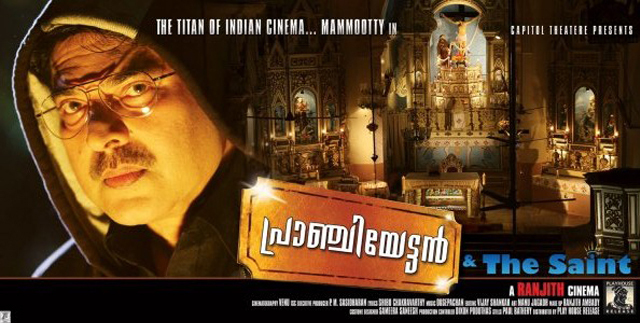 Pranchiyettan and the Saint was one of a number of Mammootty films recommended to me after I watched Kutty Srank. It sounded quite different and since the film won a number of awards it quickly moved to the top of the pile. It’s a quirky film about the attempts of successful rice merchant Chirammal Enashu Francis (Mammootty) to get rid of his nickname and command more respect within his community. 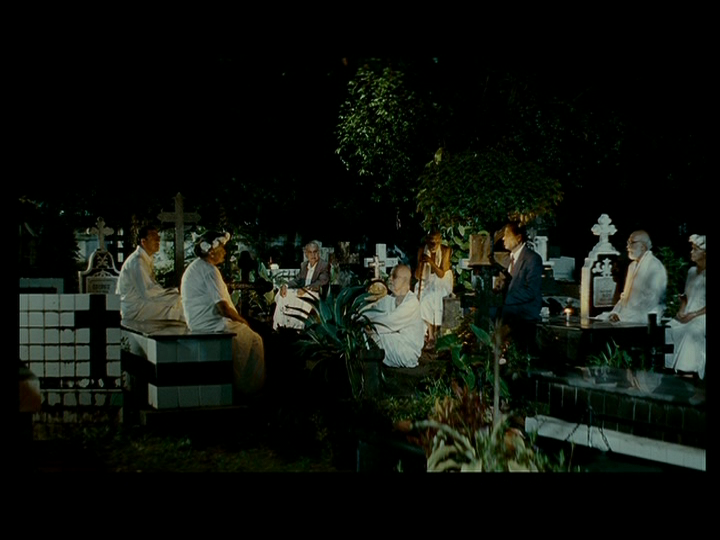 The film opens with Pranchiyettan paying his respects to his ancestors who appear as ghosts in the churchyard. Leading on with the spiritual theme, the icon of St Francis comes to life when Pranchiyettan goes into the church to pray and the subsequent story is told as a series of flashbacks as Pranchiyettan explains the circumstances around his visit to the church that night. The first half of the film deals with Pranchiyettan’s attempts to become more recognised. In this he is ably abetted by Vasu Menon (Innocent) whose schemes inadvertently fail when reality doesn’t quite manage to live up to his vision. First there is a local club election which Pranchiyettan loses to his childhood rival Dr Jose. Next there is a welcoming ceremony for a celebrity which Pranchiyettan has sponsored, but again he is pushed out of the limelight and forced to take a back seat – literally. Finally he decides to try and buy a Padma Sri award and bribes some local politicians. But as may be expected, they take his money and run, leaving him in exactly the same position as before. The film takes a lighter turn in the second half when Pranchiyettan meets a real life Padmashree (Priyamani). Although her name is the same as the award, Pappy is a feisty interior decorator with problems of her own. She gives Pranchiyettan a painting and ends up decorating his house so that there is an appropriate place to hang it. Finally Pranchiyettan tries to help his old schoolmaster achieve his goal of a 100% pass rate for his students by helping a young boy Pauli to graduate. In the course of this endeavour he starts to realise what is really important and seems to be on track to find contentment at last. The film focuses more on relationships and characters rather than following a plot driven narrative. In fact it is more of a collection of stories although there is a progression of sorts with each sequence of events. 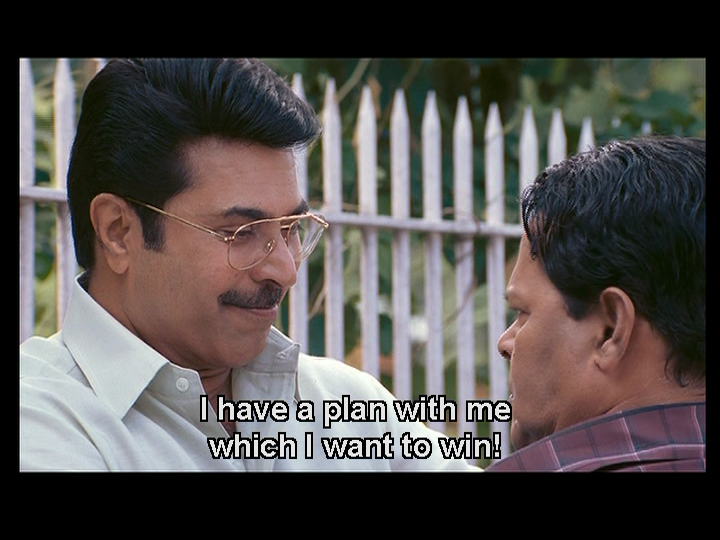 Mammootty is excellent as the nice guy who just can’t get a break. From his school days onwards he never had the sneaky gene that would have allowed him to fight back against people like the wily Dr Jose. He has remained true to his schoolyard love and seems stuck in the same mindset that he had as a student. He feels inadequate which he puts down to never finishing his schooling and tries to compensate with other achievements and public recognition. It seems doomed to failure, since his lack of confidence means he relies on other people’s ideas which don’t really seem to reflect his personality. Innocent does a good job with the character of the ever helpful friend who comes up with more and more schemes to try and get Pranchiyettan the recognition he craves. There is plenty comedy between the two in their expressions and mannerisms as much as in the dialogue, and Ranjith has made their relationship feel very natural just like an old and good friendship should be. During the course of the various schemes Ranjith pokes gentle fun at exclusive clubs, corrupt politicians and the self-grandiose behaviour of dignitaries at reception functions. It’s all very ordinary and down to earth which makes Pranchiyettan a very appealing character. Priyamani is lovely as the interior decorator Pappy. Her character has drive and purpose which makes her much more than just a romance interest. The only song in the film is pictured on Pappy and her conversion of Pranchiyettan’s home and it’s a refreshing change of pace in the film. She also upgrades his wardrobe at the same time and even gets him a new pair of glasses. I love these little attentions to detail and the very natural way that Ranjith allows his characters to interact. The final story with Pauli is marred a little by the inclusion of some comedy with a hapless tutor played (Jagathy Sreekumar). This really isn’t needed as the story already has plenty of much more subtle humour, and the actual drama of Pauli’s story is much more engaging. 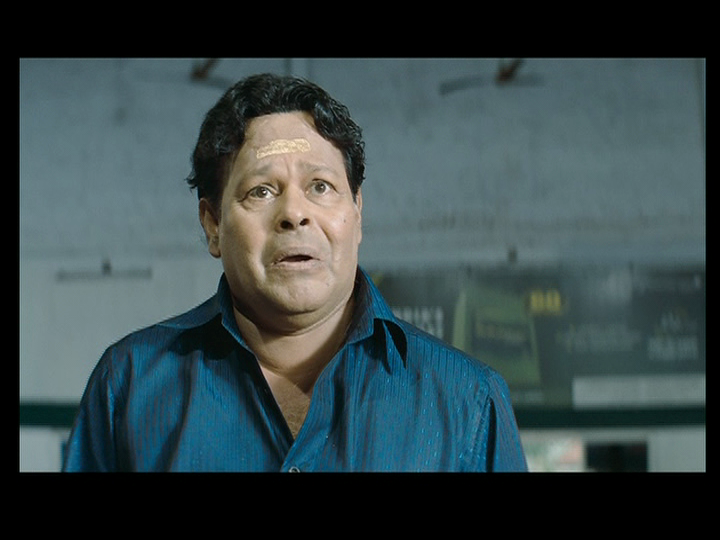 My favourite character though is Pranchiyettan’s cook Ayyappan, played by Sasi Kalinga. He has a wonderfully expressive face and the humour from his character is very droll. Again it is the everyday normality of the characters and their actions which appeals and both Ayyappan and Supran (Tini Tom) as Pranchiyettan’s driver are used to very good effect. They play well off each other and Pranchiyettan to give a really believable dynamic. The other support actors are all very good in their smaller roles. Siddique appears only briefly as Dr Jose where he takes every opportunity to have a dig at Pranchiyettan. But he has affection for his old friend which comes across in some of the later scenes. Khushboo is perfect as Dr Omana, the wife of Dr Jose, and Sivaji Guruvayoor has a small role as the headmaster of Pauli’s school. The idea of St Francis as the confessor figure to whom Pranchiyettan spills out his problems is a clever idea and helps to link the different stories together. The film relies heavily on Mammootty’s performance and without his presence I don’t think this film would have worked quite as well as it does. But an excellent performance from him and the rest of the cast do make this an film very worth watching. 3 ½ stars. If you’re one of those who believe all South Indian films are noisy, gory and lacking subtlety, this might be the film to set you straight. It’s a gentle character study with parallels to the life of St Francis of Assisi, who also plays a supporting role. St Francis was the son of a wealthy man, and became drawn to God and the Church following an illness. Several of his attempts to promote the Church went awry as he didn’t really think things through. St Francis failed when he tried to make things happen, but seemed to succeed when he simply lived his values of acceptance, charity and humility. Mammootty gives CE Francis aka Pranchiyettan aka Pranchi a sadness that helps make his needy attention seeking more sympathetic. Ari Pranchi is the son of a successful man, and he also fails when he tries to force things to happen. When he follows his true heart the results are different, and this opens his life up. Despite the apparent mismatch between Priyamani and Mammootty, their romance is appealing as it plays more as a trusting affection and partnership. I really like Priyamani and while not all of her films have been great, I have enjoyed every performance of hers I’ve seen. Pappy learns to trust the solid businessman who can see a solution to her unsolvable problem but who isn’t too proud to take her advice in the areas she knows best. Their scenes are fun and heartwarming as Mammootty shows the awkward stirrings of flirtatiousness contrasting with the confident sass of Priyamani. And you know she transforms his home from tasselled pink brothel curtains to sleek monochrome modern lines. I mourned the loss of colour for a moment, but only as a viewer – living in the icecream coloured house would have done my head in and may have contributed to Mammootty’s sour expression at times. I hope she left some of the statues and icons of St Francis though. The story with Pauli was designed to show Pranchi’s generosity, but I could have done without all the ‘comedy’. Those scenes actually had the effect of making Pauli seem like an incorrigible little git and not worth the effort. But saints have more patience for such things. And the message, which is not subtle, is a nice one. Don’t stress about rewards and titles – live with generosity of spirit and help out where you can. It’s a slight story in many respects but the structure of the narrative, the iconography and saintly presence, and the character development make it engaging and memorable. Add great performances by Mammootty, Priyamani and supporting artists like Sasi Kalinga and I think it’s a winner. 4 stars! This entry was posted in Mollywood and tagged Innocent, Jagathy Sreekumar, Khushboo, Mammootty, Ouseppachan, Pranchi, Pranchiyettan and the Saint, Priyamani, Ranjith, Sasi Kalinga, Siddique, Sivaji Guruvayoor, Tini Tom. Bookmark the permalink. Again, awesome review. This film was one of the greatest films (in Malayalam) which came out in 2010. People loved it because of the comedy and the sedate/tranquil settings of the film. The dialogues, the characters and the situations (except that boy’s) were pretty well sketched. Another thing which I personally loved was the “Thrissur” slang (a sing-song version) Malayalam, which was used in the film. “Pranchi” in Malayalam means “Francis”. “ettan” means “brother”. 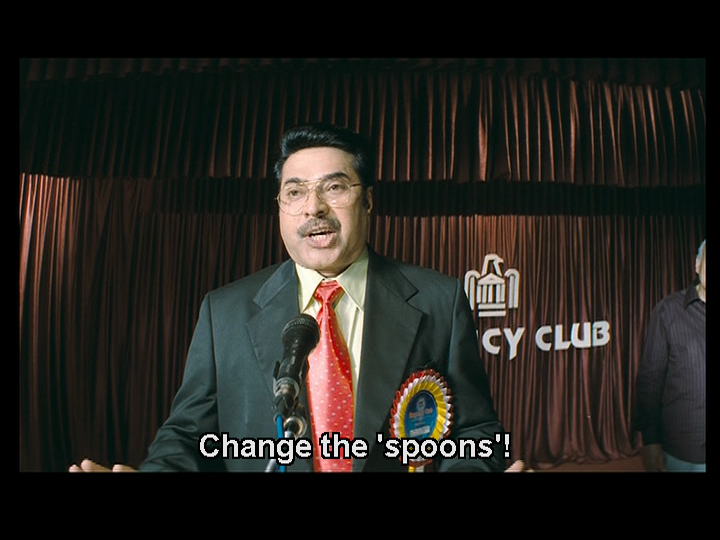 Mammootty is astute enough to do a couple of films like these regularly. Another recent film of his, which was critically acclaimed was the film “Paleri Manikyam”. Thank-you for your comment and the explanation of Pranchiyettan 🙂 The subtitles explained the ‘ari’ but not the rest and it really helps to know the meaning. Maybe in this way I will gradually learn some Malayalam too! It’s very early in my discovery of Malayalam films and I really do appreciate your suggestions. Keep them coming! 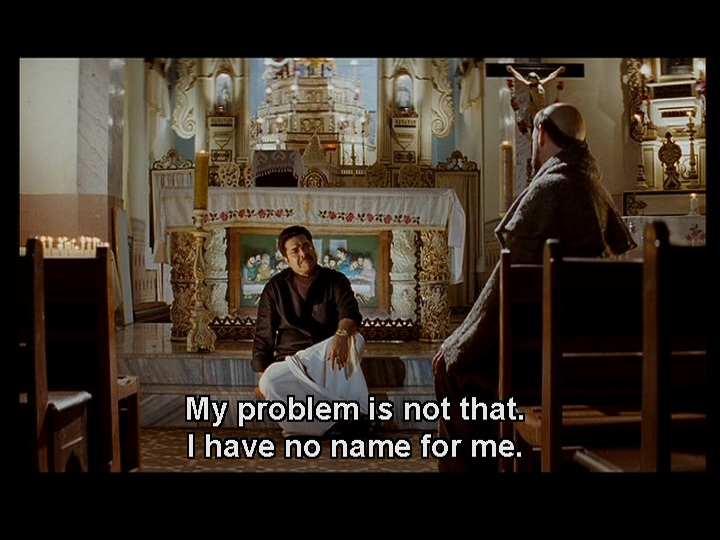 I saw Sasi Kalinga for the first time I think in either Paleri Manikyam (highly recommended semi-art film by Ranjith) or Kerala Cafe (which I highly recommend also). So little time, and so many movies I want to watch!! I plan to write about a number of the films you have mentioned in your list (I’ve seen most of them) and would agree that there have been some excellent films released in Kerala recently. Hopefully many more to come too!